Cyanobacterial cells, seen in the red fluorescent color, attached to rock samples. 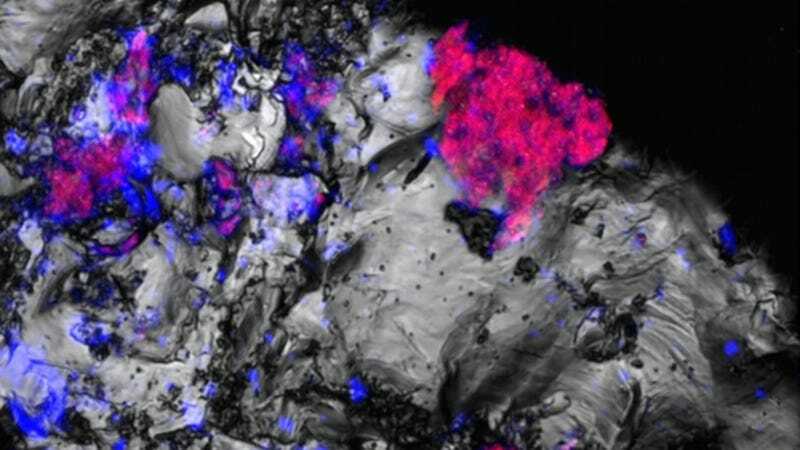 An international team of researchers has identified a peculiar population of cyanobacteria living within rocks deep below Earth’s surface—a surprising discovery given that cyanobacteria require sunlight to survive. Or so scientists thought. New research published this week in Proceedings of the National Academy of Sciences describes the unexpected discovery of cyanobacteria deep below the surface of an abandoned mine in the Rio Tinto region of Spain. This area is home to a rock formation known as the Iberian Pyrite Belt, a site that’s popular among scientists due to its similarities to Mars, in particular its concentration of iron and sulphur. To see if any life might exist deep within this rock, a team led by Fernando Puente-Sánchez from the Spanish Centre of Astrobiology in Madrid drilled a 2,011-foot-long (613-meter) borehole into the rock, pulling up cylinder-shaped sample. Back at the lab, Puente-Sánchez’s team found traces of bacteria living in the rock’s crevices, which is not surprising. Back in 2006, for example, scientists found bacteria almost two miles beneath the surface. What was surprising, however, was the discovery of living cyanobacteria within the rocky sample. That’s weird because cyanobacteria, like plants, acquire energy via photosynthesis, whereas “regular” bacteria eat dead or decaying matter. The rock sample containing the cyanobacteria. Cyanobacteria are super versatile and highly adaptive microorganisms, capable of finding a home in most environments, whether it be an arid desert or an aquatic landscape. Because cyanobacteria is photosynthetic, however, scientists figured its habitat—while undoubtedly diverse—had to receive at least some sunlight. Cyanobacteria, as the new discovery shows, are more adaptable than we thought. Puente-Sánchez and his colleagues were so surprised to find cyanobacteria within their sample that they went back to Rio Tinto to collect more rocks, though this time with stricter protocols to prevent contamination. But they got the same result, finding traces of living cyanobacteria nestled into the rocks. So what’s going on? How can these microorganisms survive at such extreme depths with no access to sunlight and scant traces of water? Observed through a microscope, the subterranean cyanobacteria appeared similar to their cousins that live on the surface. Genetic analysis, however, told a slightly different story; the enigmatic cyanobacteria produce enzymes that convert hydrogen into useful energy. And revealingly, the researchers observed lower levels of hydrogen within the air pockets of the rocks where the cyanobacteria lived compared to areas in which they were absent. This suggests the underground microbes are consuming hydrogen gas to get their fuel. But how could these microbes possibly evolve this trait? For subterranean organisms, evolution is practically impossible given, in the words of the researchers, “minimal opportunities for the introduction and propagation of beneficial mutations.” The traits required to live underground, the researchers argue, were likely acquired elsewhere. The cyanobacteria then became “perfect candidates for inhabiting the deep subsurface,” as they were already adapted to living inside rocks and “able to withstand severe nutritional and environmental stresses,” such as periodic oxygen-starvation, the researchers write in their paper. This discovery shows just how resilient and adaptable life can be. But as the authors point out, it could tell us something about the origin, or the presence, of life on other planets, particularly Mars. If microbes can live thousands of feet beneath Earth’s surface, and with no access to sunlight and water, where else in the Solar System or galaxy might we find life?